So what was happening inside the building, do I hear you wondering, while I was exploring the narrative possibilities of the side-walks? Well, with just over two months remaining to Hand-Over, it was by now largely a story of fixtures and fittings. Not so interesting to me, it has to be said, but, to one who has taught creative writing, there’s always a story in there somewhere. I can highly recommend the book ‘Tell It Slant: Writing and Shaping Creative Nonfiction’ (my favourite writing genre, if you hadn’t already guessed) by Brenda Miller and Suzanne Paola. The title is taken from the opening line of an Emily Dickinson poem: ‘Tell all the truth but tell it slant -‘ All writing channels someone’s world view, of course. You get mine. To me it’s as clear as day the glass photographed above is green. Tough. And clearly it is tough because it is green. 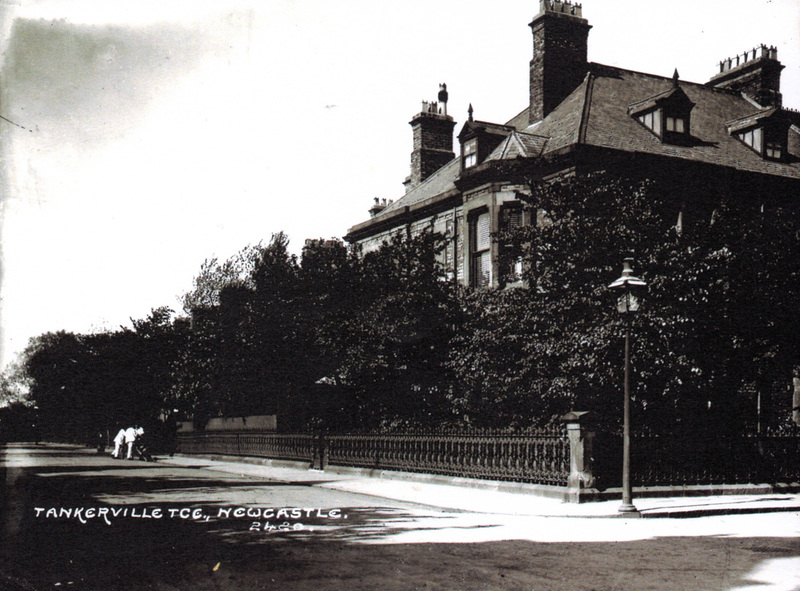 The Newcastle High/Church High north stairs. The old dark wood north stairs will always hold a special place in my heart, but I guess they did take up a lot of space and created split floor levels on every landing. 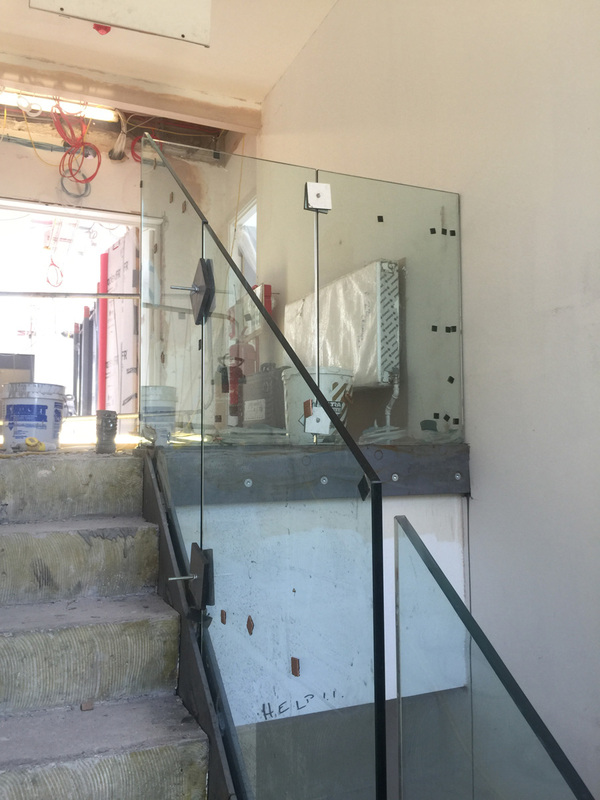 The new staircase design in the circulation extension is less characterful but more economical of space. 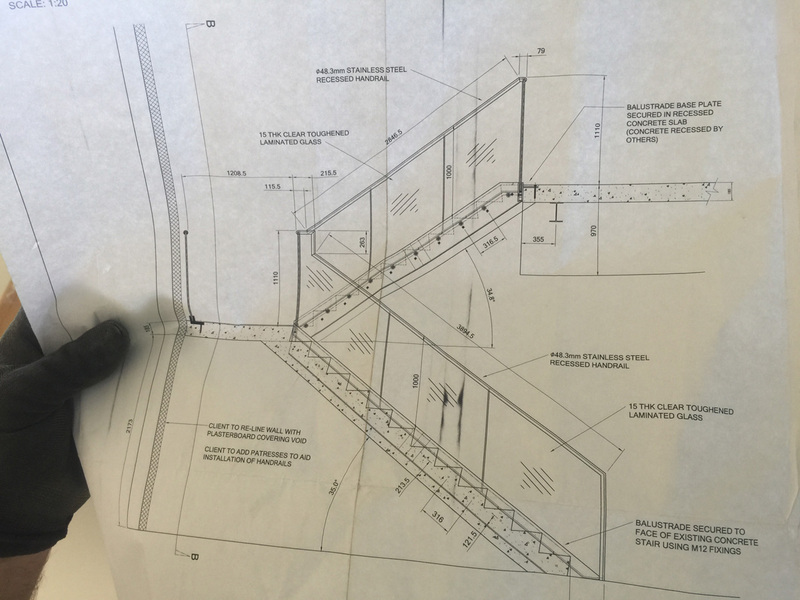 M & G Olympic’s design for the new NHSG north staircase. 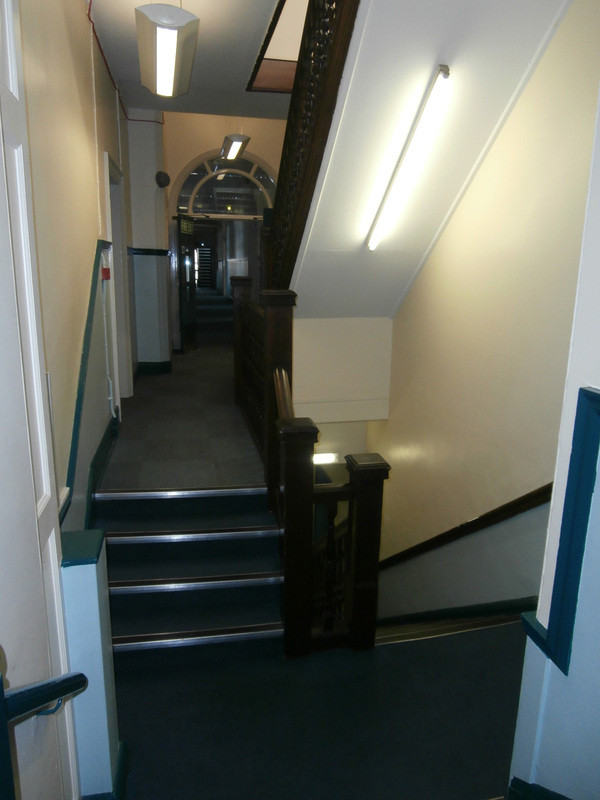 The original wood Newcastle High/Church High south stairs still remains, but all other staircases in Newcastle High School for Girls are now identical. 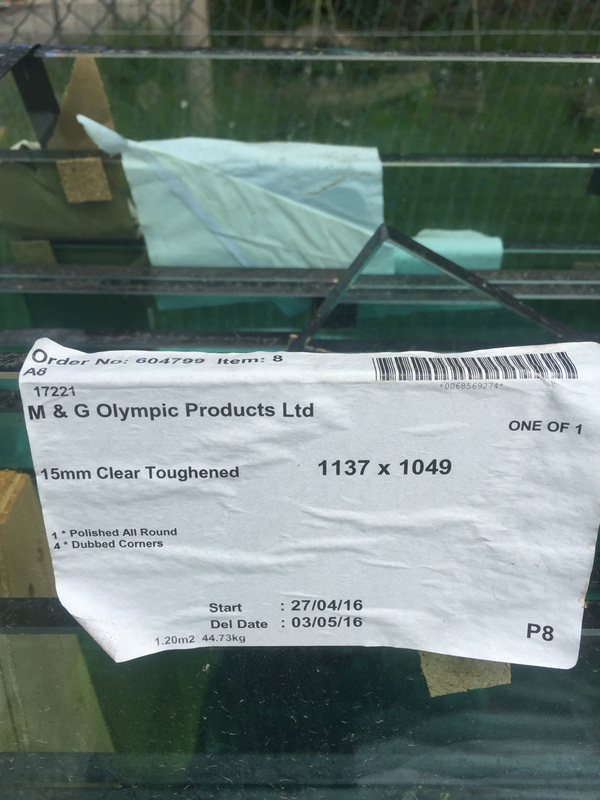 M & G Olympic’s design for the re-fit incorporates balustrades of toughened laminated glass with stainless steel handrails. Giuseppe’s photos show the installation process. The slight green tint to this large expanse of glass as it winds upwards above you really is very beautiful. Whilst not exactly a stairway to Heaven, it brings to mind another line of Thoroughly Modern Millie: ‘Pin my future on a green glass love/What kind of life am I dreaming of?’ Glass reflects light, of course, so the new stairwell in the old building infill extension will never be a dark place – greatly helped by the addition of a large window on the very top landing. 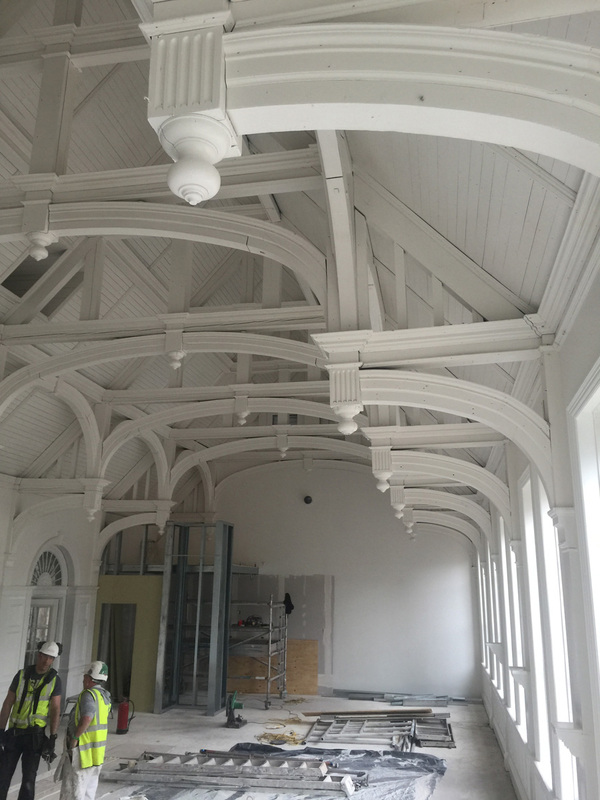 The large window installed at second floor level looks out onto the roof of the 1927 extension (the old Church High Geography rooms). 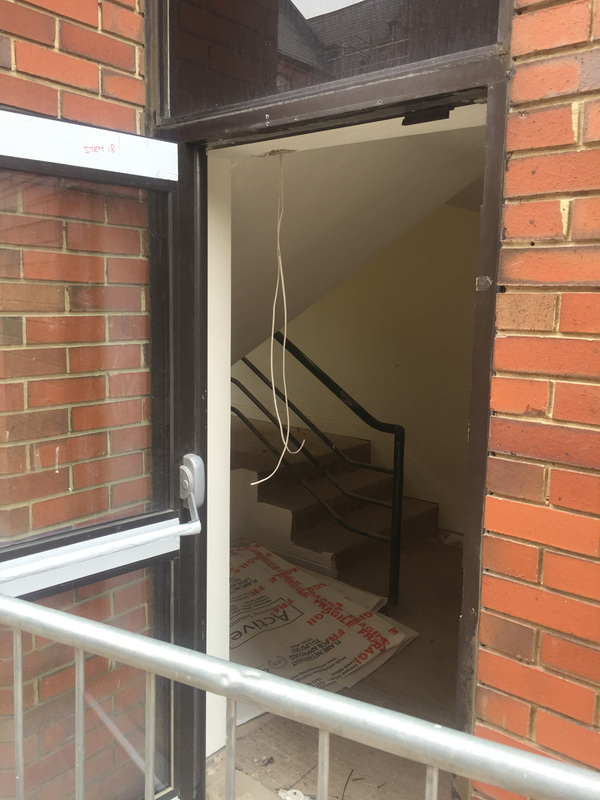 Waiting to provide the finishing touch to the new-look stairs, the stainless steel handrails were at that time all piled up in the yard. 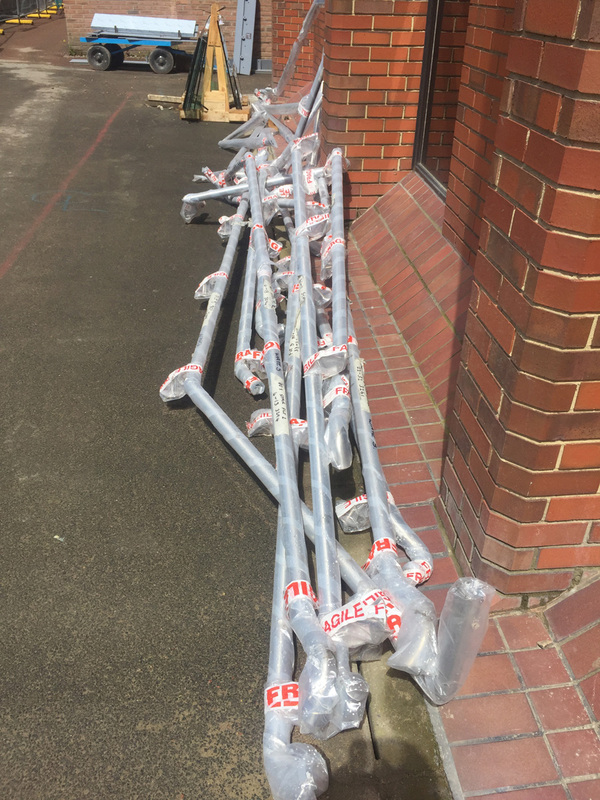 Stainless steel handrails waiting to be fitted. 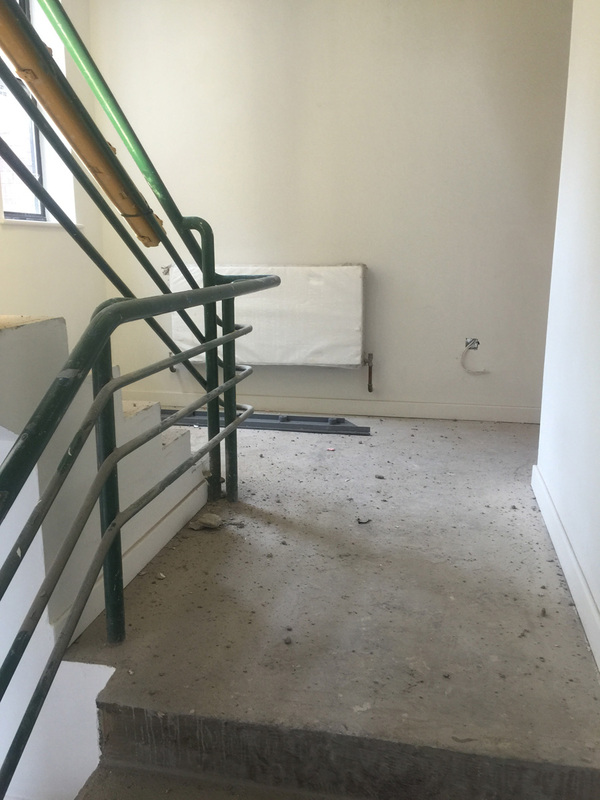 On June 9th, work had yet to begin on the Science Block staircase. 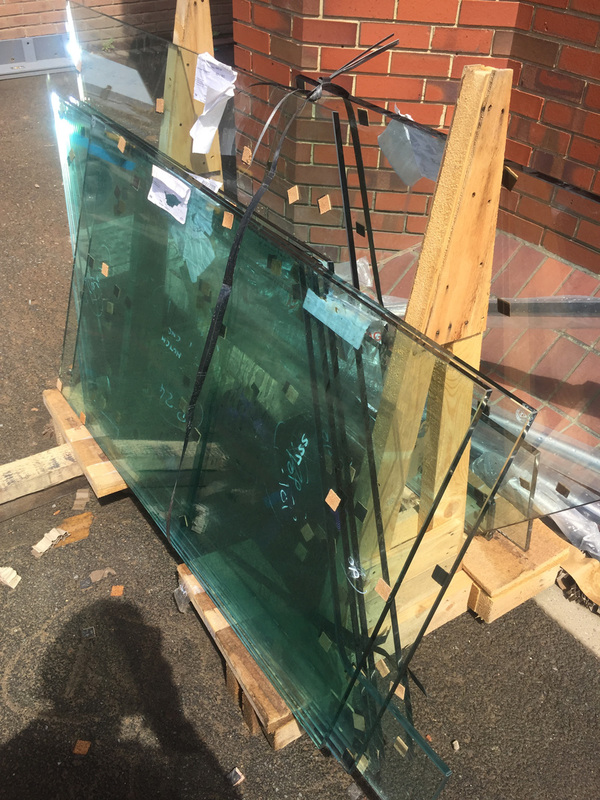 Despite ‘having found myself a green glass love’, it was still really nice, thanks to Giuseppe, to know one stairway was still as it used to be. 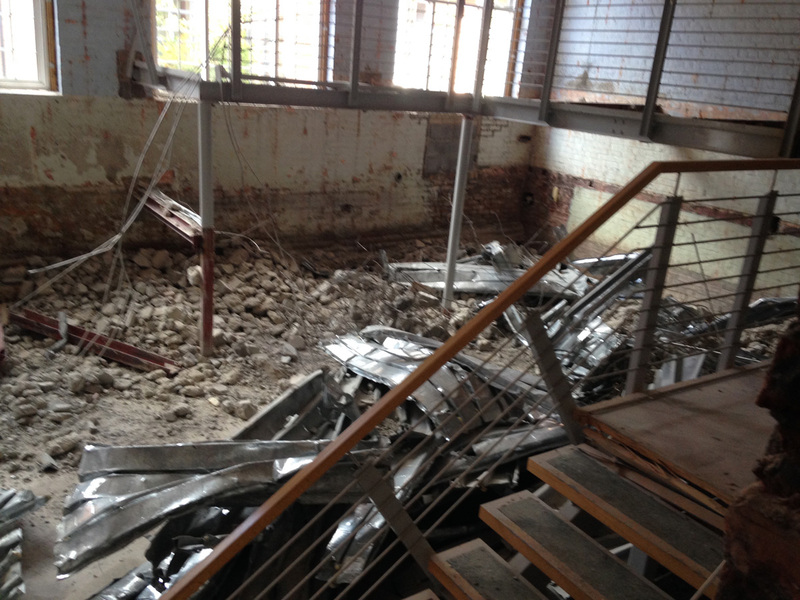 The open door onto the courtyard shows the Science Block stairs are, as yet, untouched. Until I looked at these pictures in retrospect, tinged with nostalgia, I can’t say I was ever really aware the handrails here were green metal. It’s funny how little attention we actually pay to integral features of a building we use every day. I’ve learned that from this process. The photo below, taken just a few days later after the handrails had been removed, shows that even they had a certain kind of beauty. 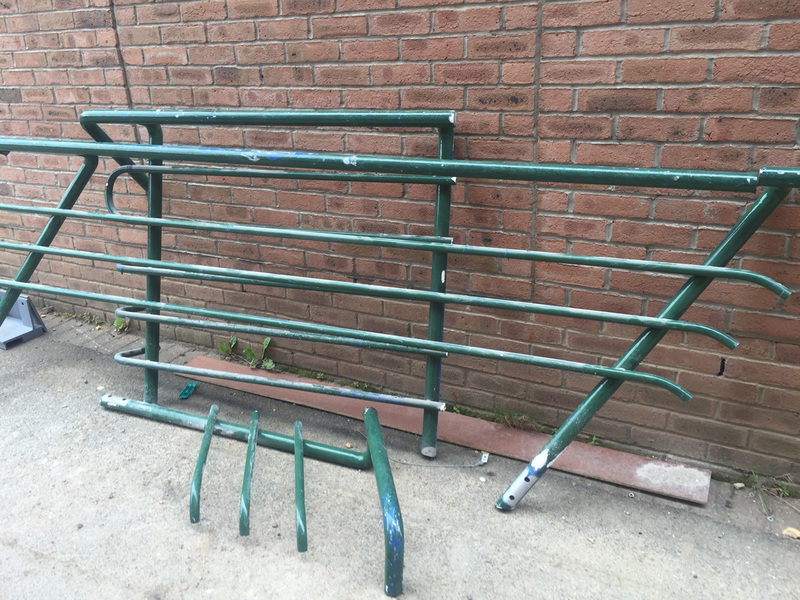 The green metal handrails look subtly different out of context. 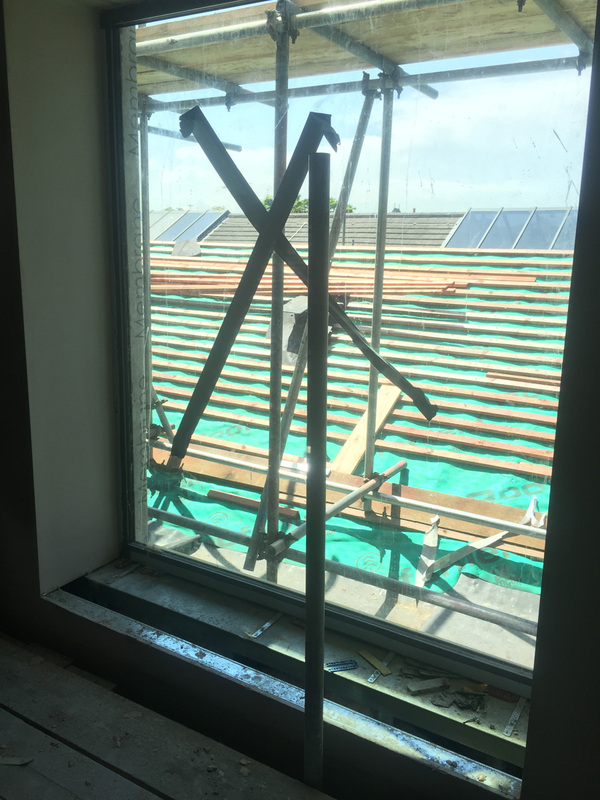 To colleagues who didn’t know the building beforehand – or never thought to take the time to come and look at it as we knew it – it would be easy to assume that it has had a total modern make-over. But some of us know different. 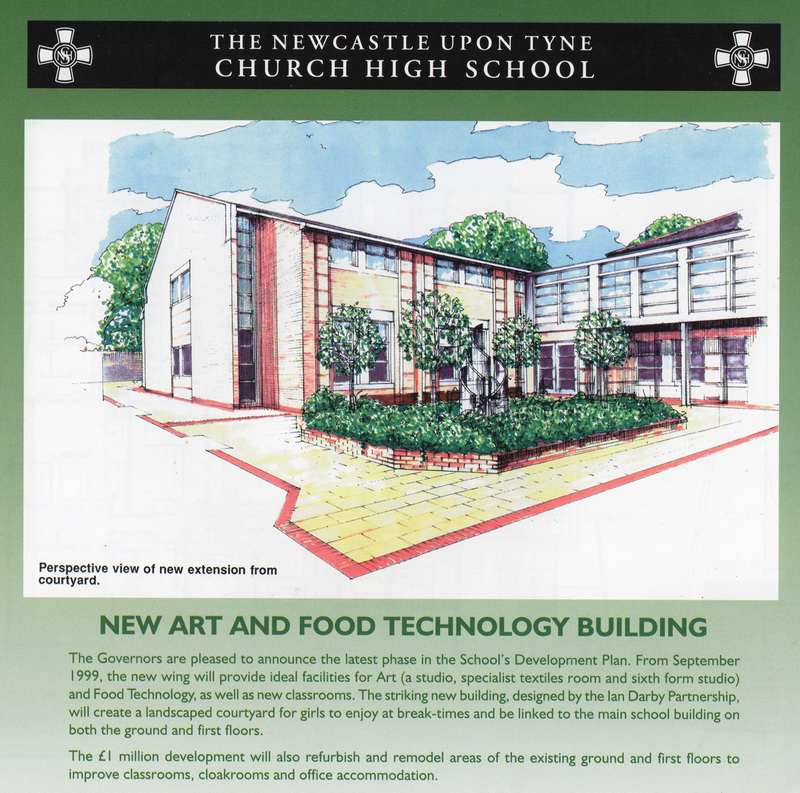 One of the most beautiful modern features of the Church High building was situated at its very heart: the sweeping promenade of ash wood and steelwork which made up the Learning Resources Centre mezzanine levels and stairways. When I’ve shown pictures of it subsequently to my ex-Central colleagues, to say they were surprised would be an understatement. It’s ridiculous, from my point-of-view at least, that the most modern stairway on the Tankerville site ‘failed to make the final cut.’ And it was simply devastating to see it all reduced to rubble. What waste. Sad sight: LRC being dismantled during the strip-out process. Thanks to this blog, however, at least we can remember it at its best. 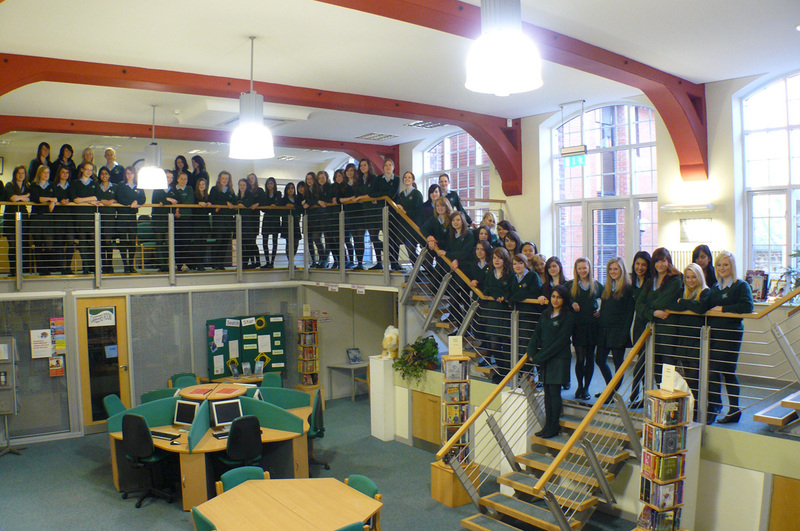 The mezzanine levels of the LRC made the perfect venue for a final photo of the rank and file in green on Y11 Leavers Day. ‘Tell all the truth but tell it slant -/Success in Circuit lies/Too bright for our infirm Delight/The Truth’s superb surprise/As Lightening to the Children eased/With explanation kind/The Truth must dazzle gradually/Or every man be blind -‘ [Emily Dickinson]. Whether you agree or not, graffiti is an art form of sorts. Studying ‘The Art of Creativity’ for my OU Diploma in English Language Studies, I had to read an intriguing essay by Nancy Macdonald entitled ‘The spray-can is mightier than the sword.’ She observes that ‘while often highly visible, the meaning and significance of street graffiti tends to be private. 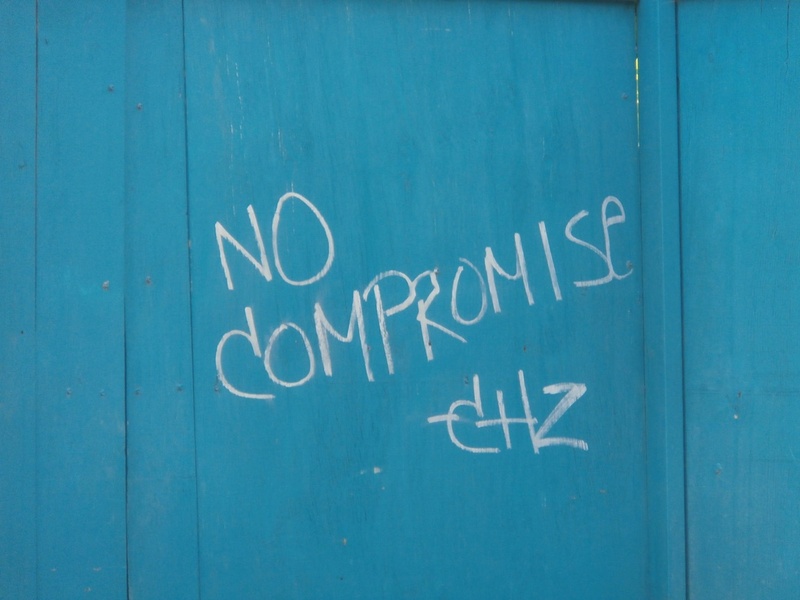 Like urban wallpaper, it sits quietly in the background of our everyday lives – recognised, but barely understood.’ We never had much trouble with graffiti at Church High, but then Jesmond isn’t really that type of place, is it? 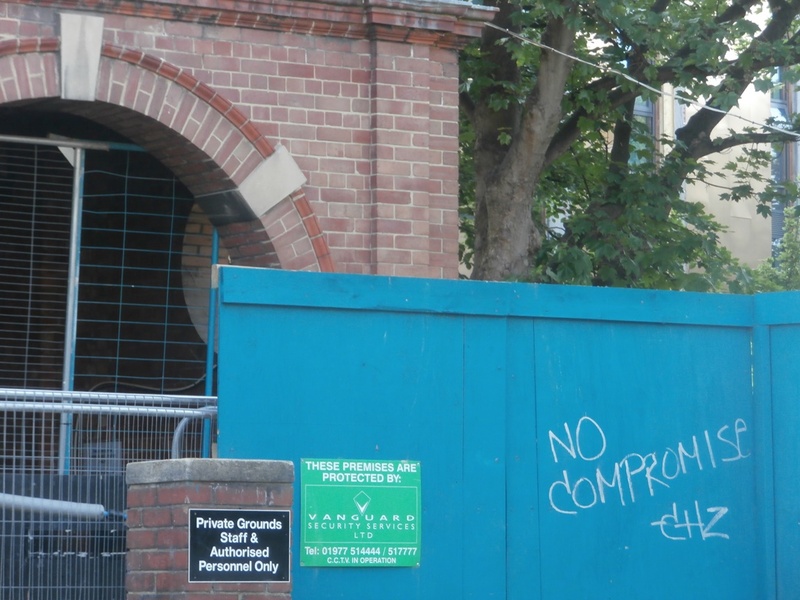 However, I’d noticed some graffiti had appeared on the hoardings around the old building recently. It had rather intrigued me, I must admit – both the tag and the message. 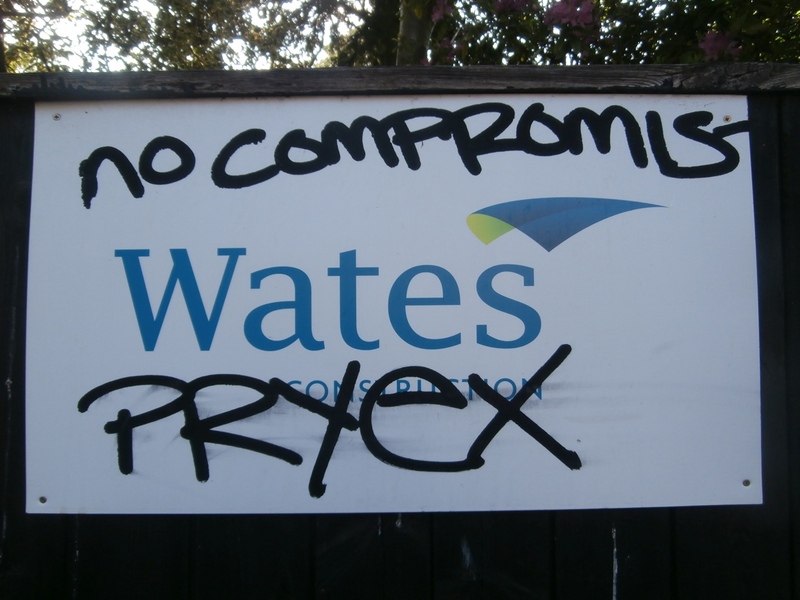 Recent graffiti on the teal hoardings around the old building. Was it just a coincidence that the first two letters of the sprayed on tag were CH? And the message too? Was there not something very apt about it, I thought, reduced once again to peering through the mesh site gates? Macdonald goes on to observe how spray-painted words ‘impose themselves upon the unsuspecting environment, proud and standing out upon [what she refers to as] their conquered context.’ There’s a lot of signage on the fencing, but the graffiti appeared in two places only: here and once on the Junior School fence. 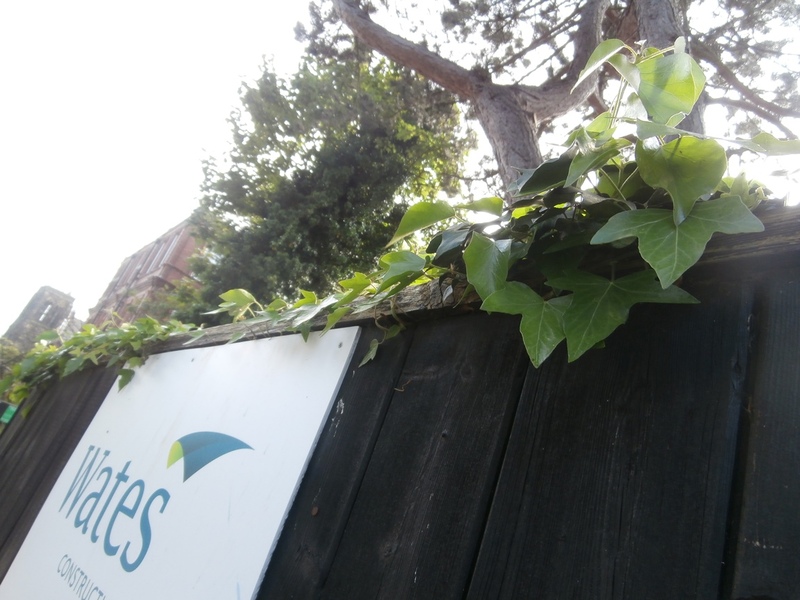 One of Wates’ signs positioned on the old Junior School fence. 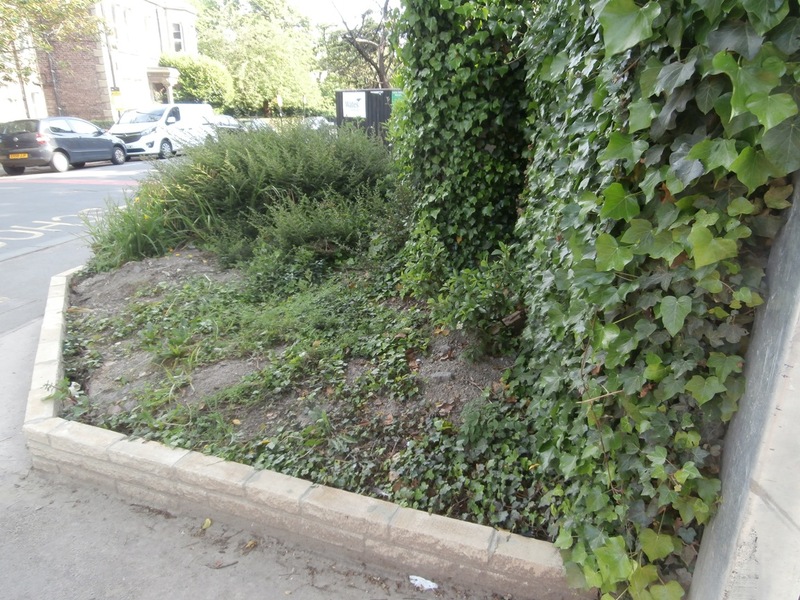 It was one of those lovely summer afternoons and elsewhere along the perimeter fencing the ivy looked positively luscious as it edged its way out of the grounds and over the top of the original fencing. I noticed also that the little stone wall had been re-built yet again. No compromises: that low stone wall is repaired every time! 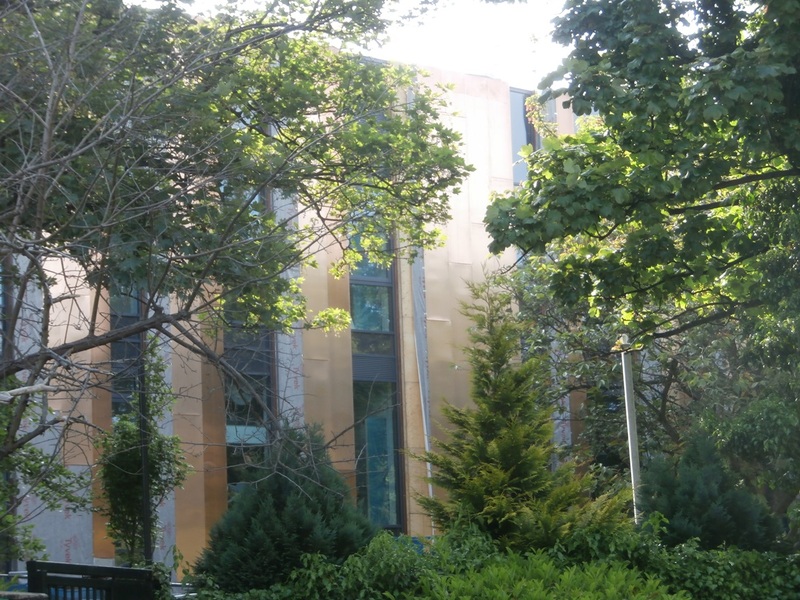 Poking my lens through one square of the metal fencing, I was able to capture a lovely shot of the new building framed by greenery. 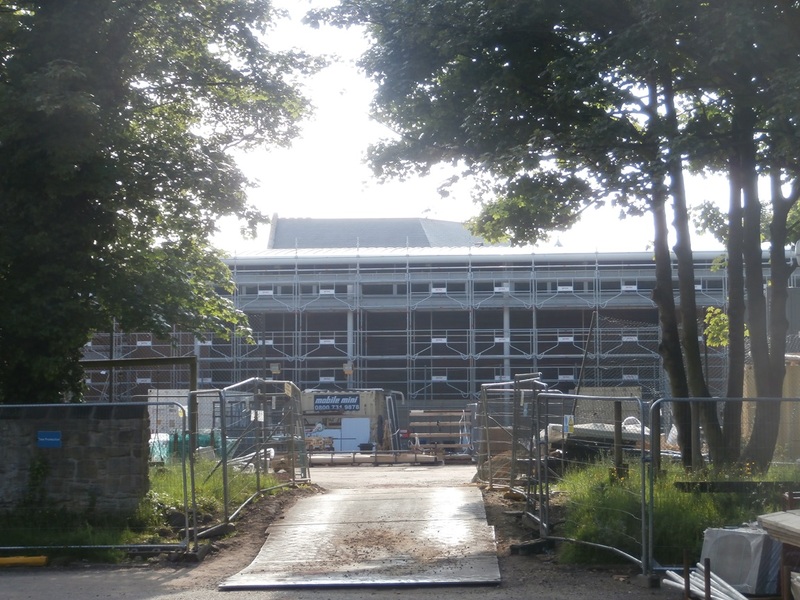 And further up the road again, I captured this view of the Sports Hall still shrouded in scaffolding snatched through the upper site gate. 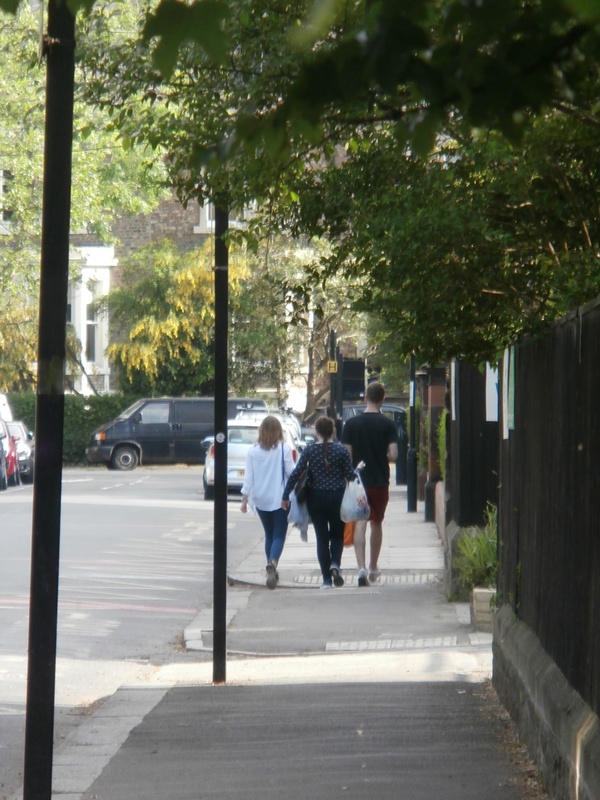 Looking back down the street, zoom lens fully activated, Tankerville Terrace was brought into focus as I most remembered it in summer: a calm, leafy, light-dappled canvas peopled by sauntering students. 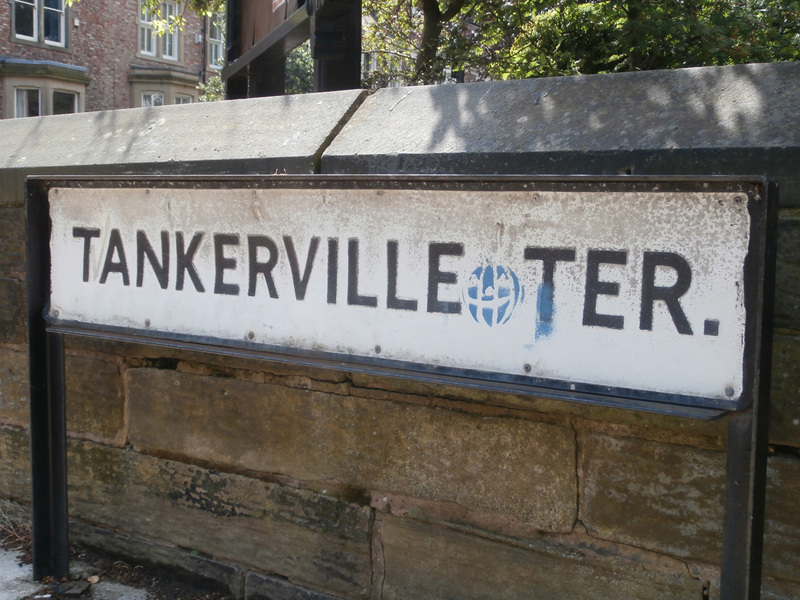 Lovely, sleepy Tankerville in the summertime. Turning to my left looking for more subject matter, I realised I was virtually facing the old Royal pillar-box on the other side of the road. 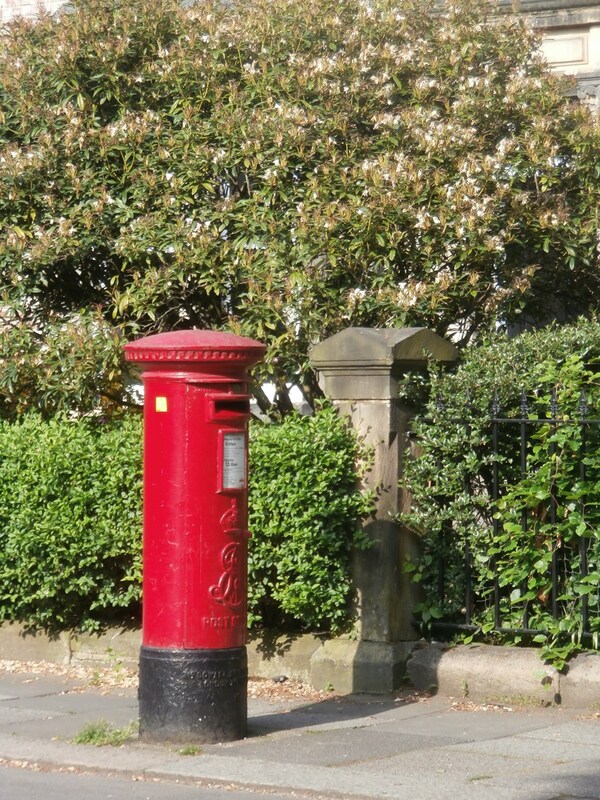 Old Royal Mail pillar-box, Tankerville Terrace. Learning to take photographs as a young girl, my Dad always told me to try to get something red in every shot – it brings the image to life. So true. This particular pillar-box is as significant in the past history of Church High School as that lamp-post in the woods in C.S. Lewis’ magical story of ‘The Lion, the Witch and the Wardrobe’, of course. 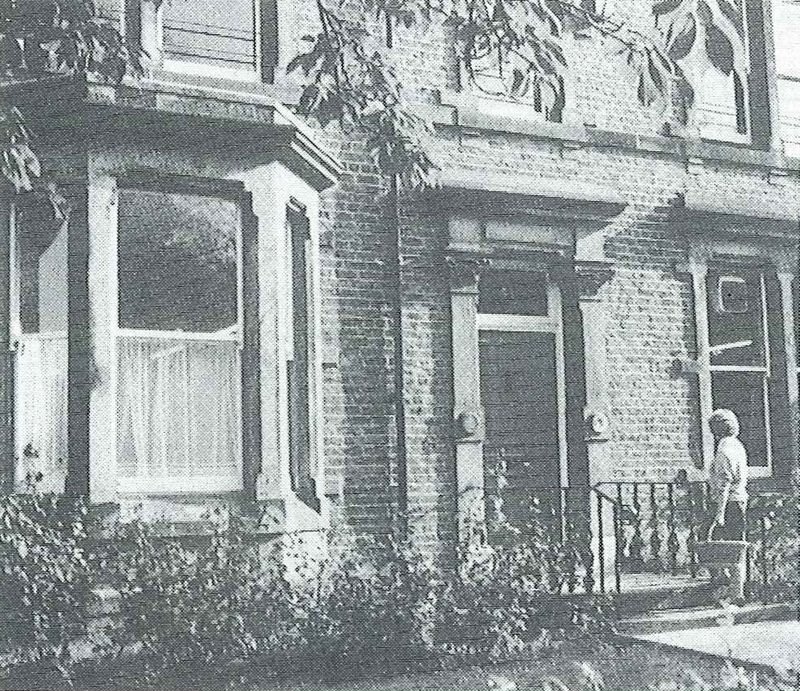 We all used it as the marker for Gurney House further up the street. 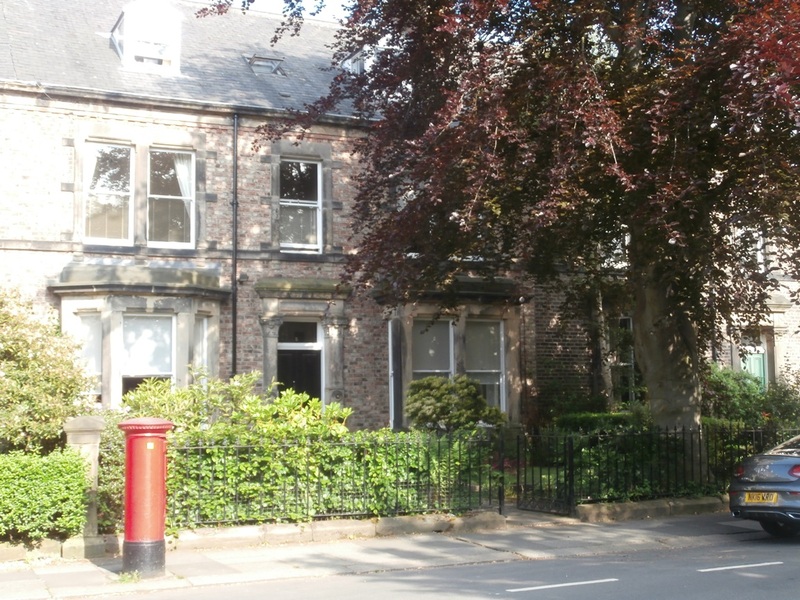 The house behind the pillar-box used to be Gurney House. Mrs Pybus recalls in her section of The Centenary Book that No. 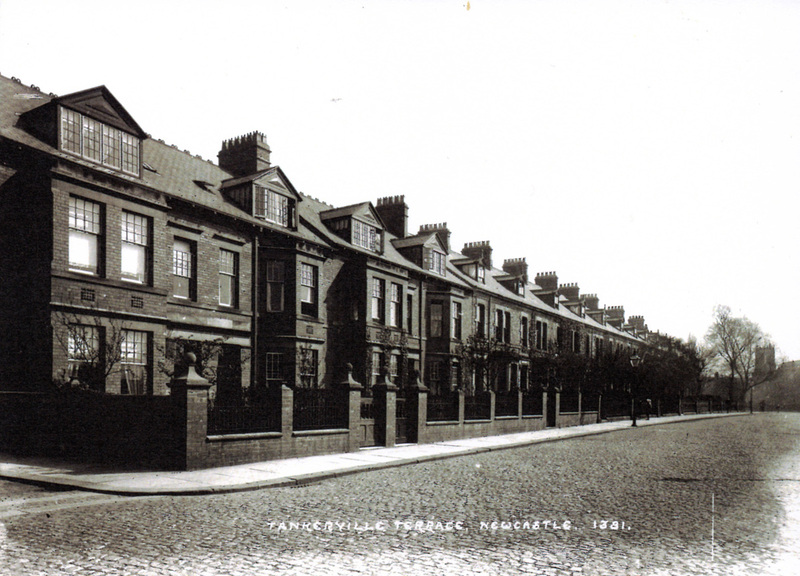 4, Tankerville Terrace was purchased by the Governors in 1946, initially for the use of the younger girls in the Junior School. 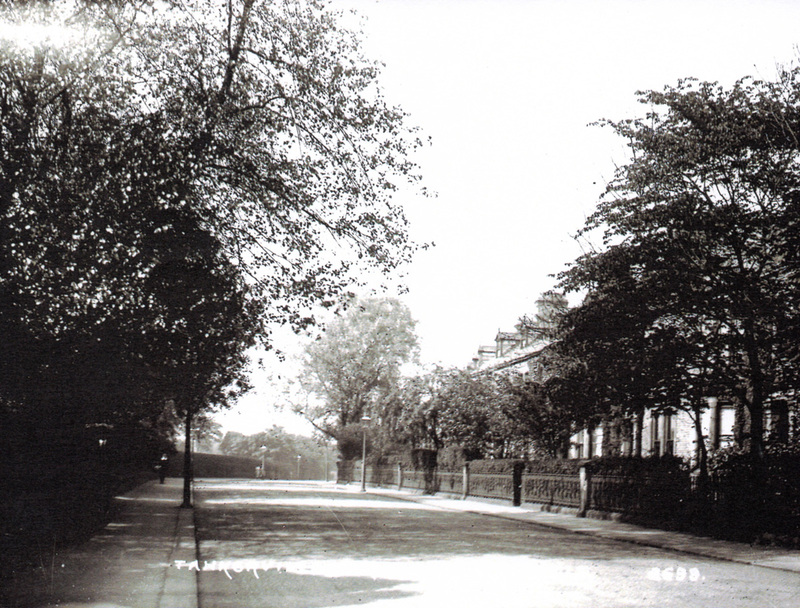 The Nursery Class and the Kindergarten moved there first and the six-year-olds followed after the alterations were made. The two big rooms were used for Junior Art and Sewing. 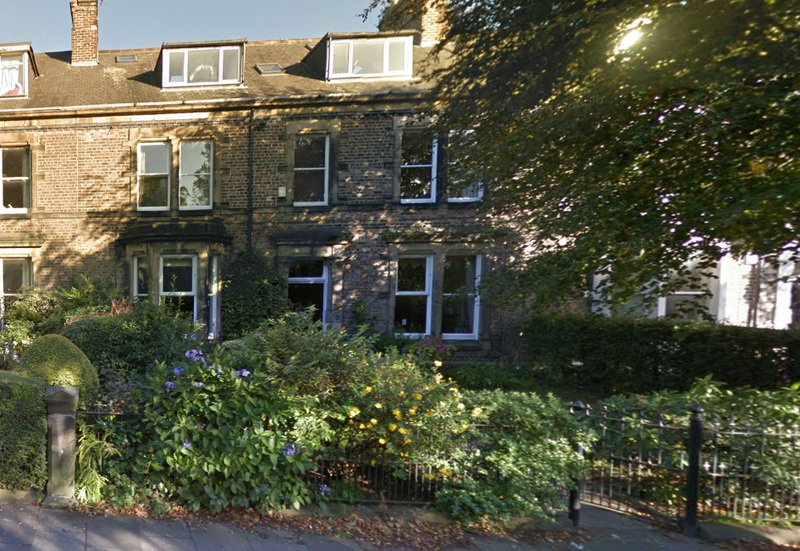 It was named Gurney House in honour of Newcastle High/Church High’s longest serving Headmistress, Miss Louisa Mary Gurney, who travelled North to officially open the building, post-renovation, in October 1947. 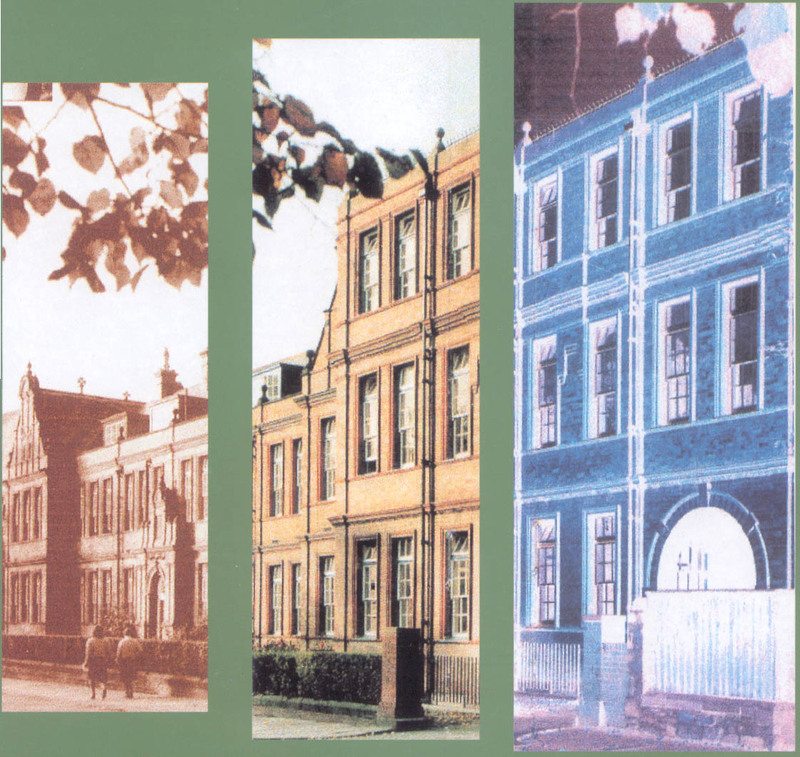 By the time I joined Church High, Gurney House was being used for Senior School Art, Speech & Drama, Home Economics & Computer Science. 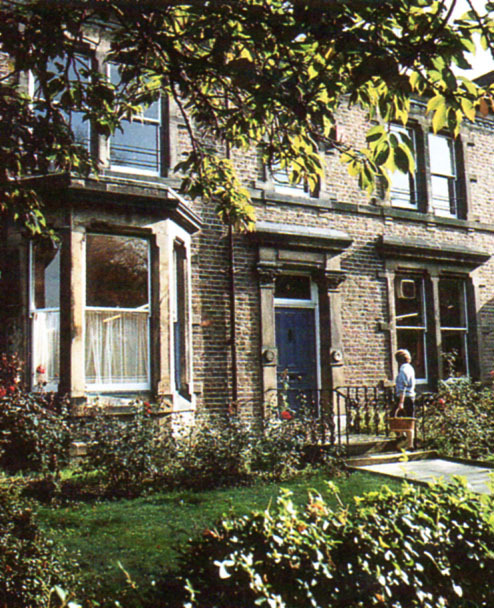 Gurney House as it looked in the mid 1980s. 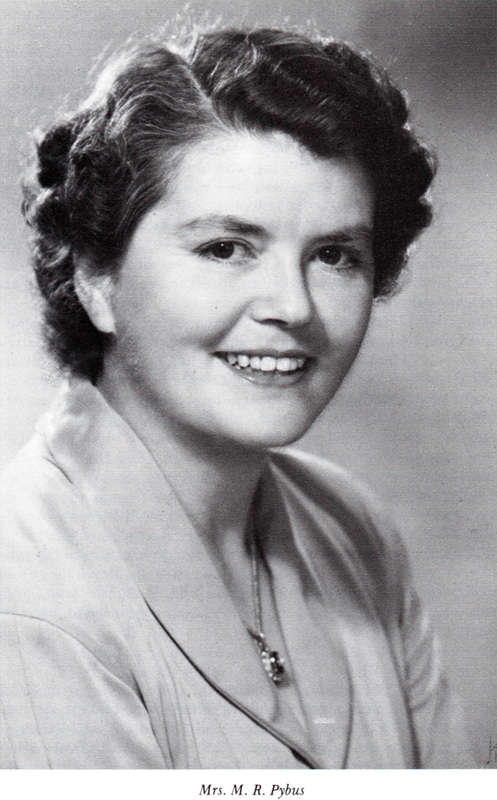 Image of Miss Gurney which used to hang in Gurney House. 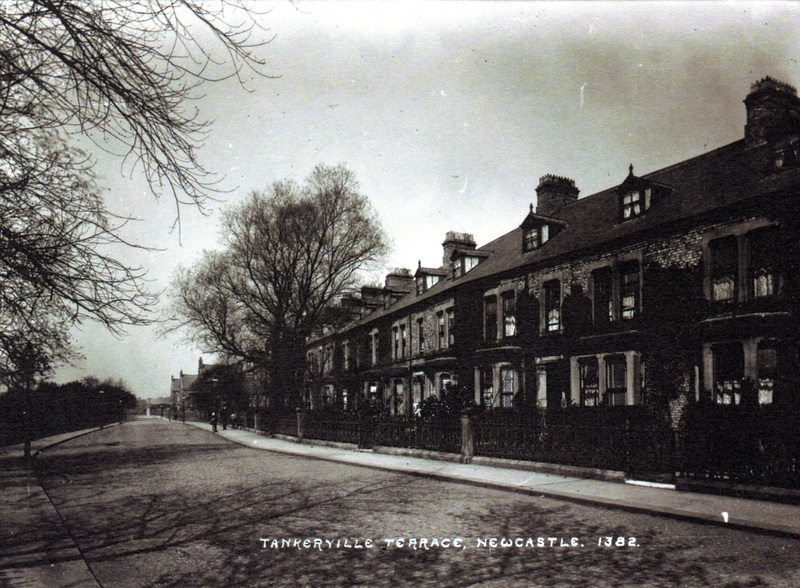 I really enjoyed my saunter down memory lane as I made my way down Tankerville Terrace, camera in hand, that sunny afternoon. However, I may not have enjoyed it quite as much if I’d known at the time what was happening inside of the building. 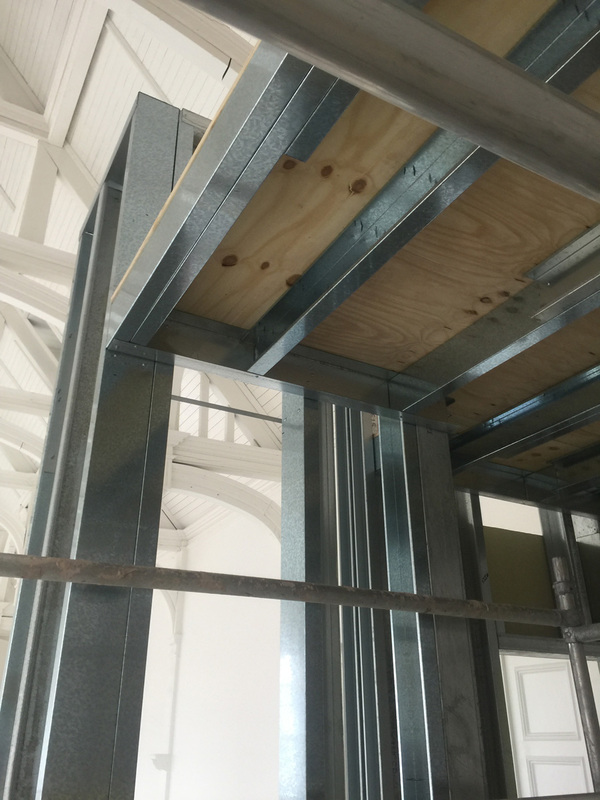 As Giuseppe’s photos show, huge metal girders were being put into place in the old Assembly Hall in order to create the framework for the Sixth Form Common Room Deli Kitchen. Way too much for me to stomach – no pun intended. I cringe to think what Miss Gurney would have said. 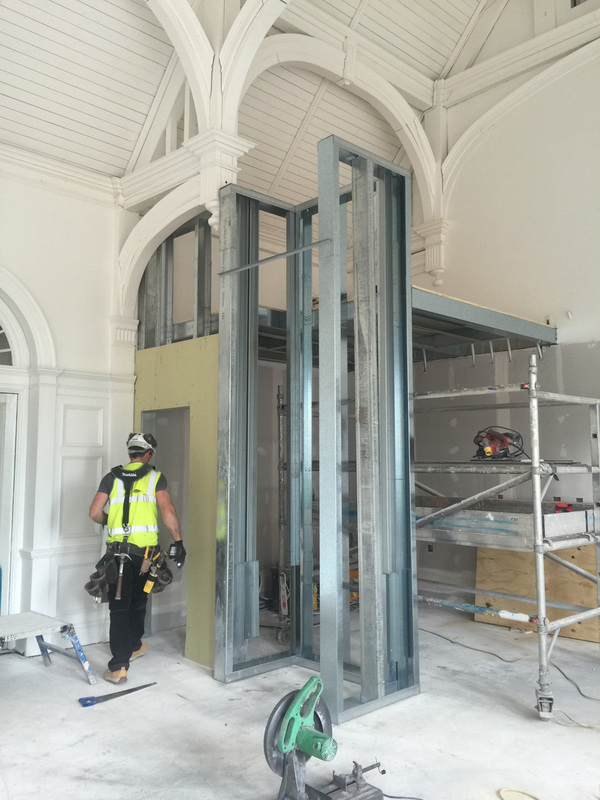 Steel girders being fitted within the Old Hall. But I refuse to end on a ‘downer’; the only way is up from now on. 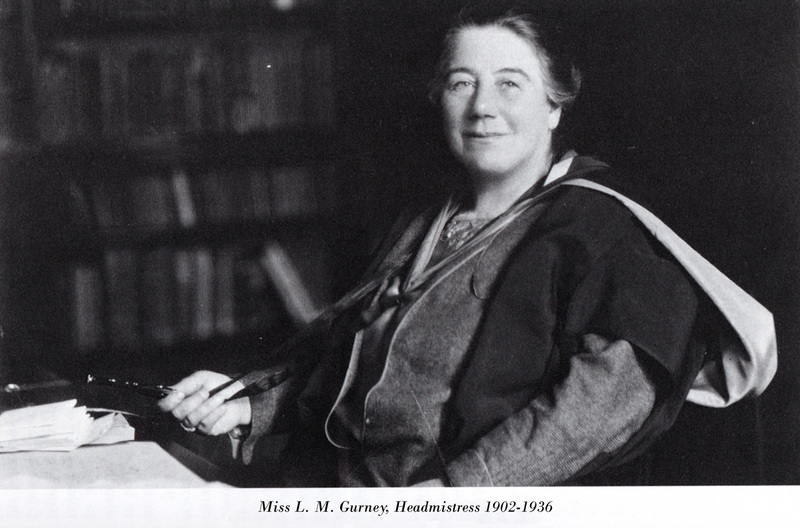 I thought you might like to know that researching Miss Gurney’s full biographical details in the City Library a few weeks ago, I was reminded that before she was appointed Headmistress in 1902 she was teaching Mathematics at The North London Collegiate School. If you don’t know the story of girls’ education in the 19th Century, this school, founded by Frances Mary Buss, was the real trail-blazer. 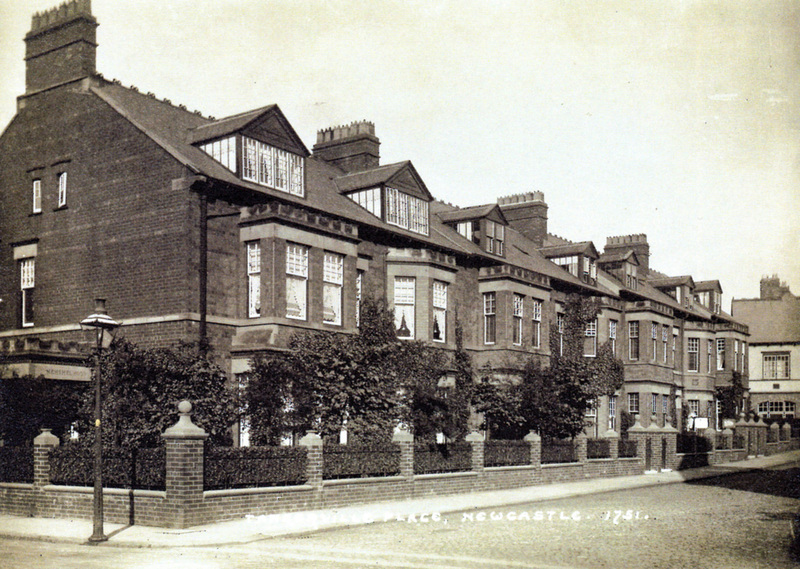 The fact that Miss Gurney learned her craft there under the Headship of Dr Sophie Bryant serves to remind us of the pedigree of The Newcastle Upon Tyne Church High School when it was created. As does the fact Miss Gurney was only 29 when she became a Head. 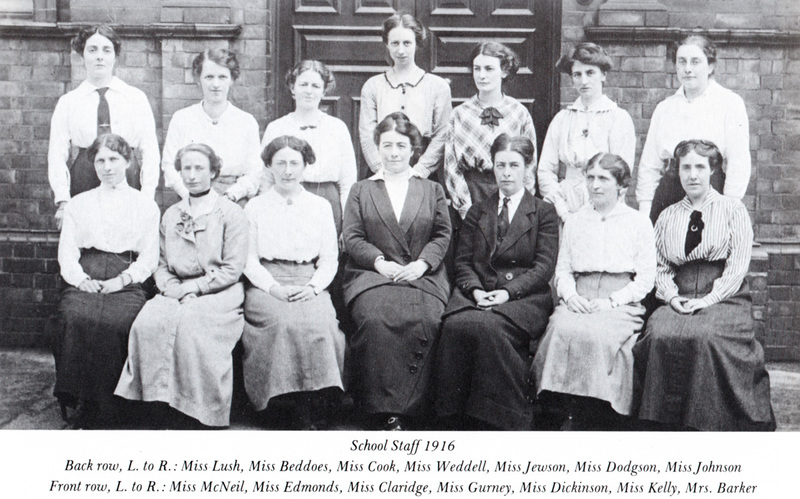 The young Miss Gurney (centre) with her staff in 1916. 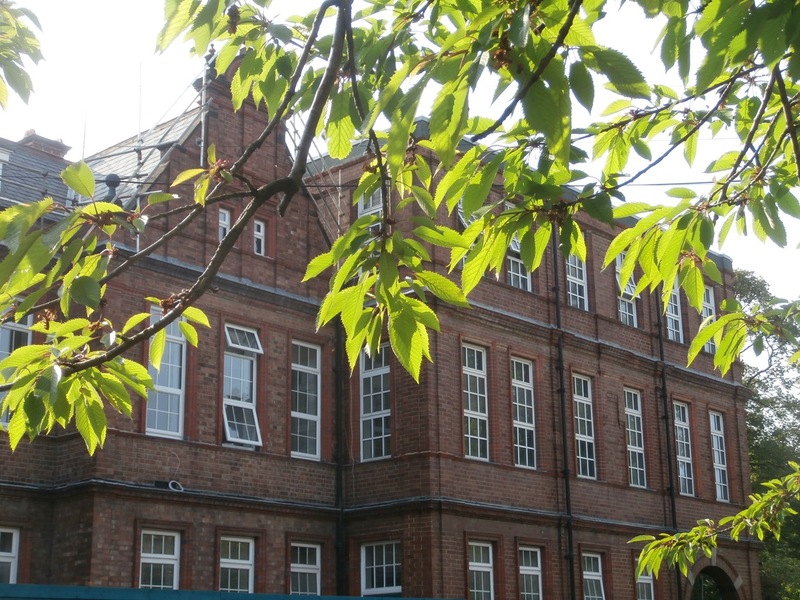 On a whim, I decided to contact The North London Collegiate School by email to see if they could provide me with any information about the time Miss Gurney had spent teaching there. As with many things in our story, my email proved to be very timely indeed. How could I have known that the archivist there, Karen Morgan, was in the process of preparing archival information for their Founder’s Day Ceremony which is celebrated at the end of the Spring Term? Nor that the focus of this year’s speech and celebrations was to be the proteges of Headmistress Sophie Bryant who went on to be Heads in their own right? 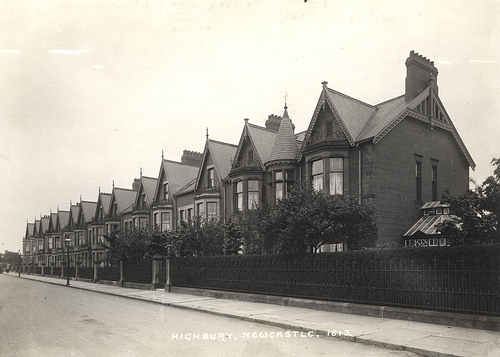 You will be delighted to hear that the three images of Miss Gurney included in this post have now been digitally enhanced and are now part of The North London Collegiate School’s prestigious Archives. At least one may even feature in this year’s Founder’s Day Exhibition. 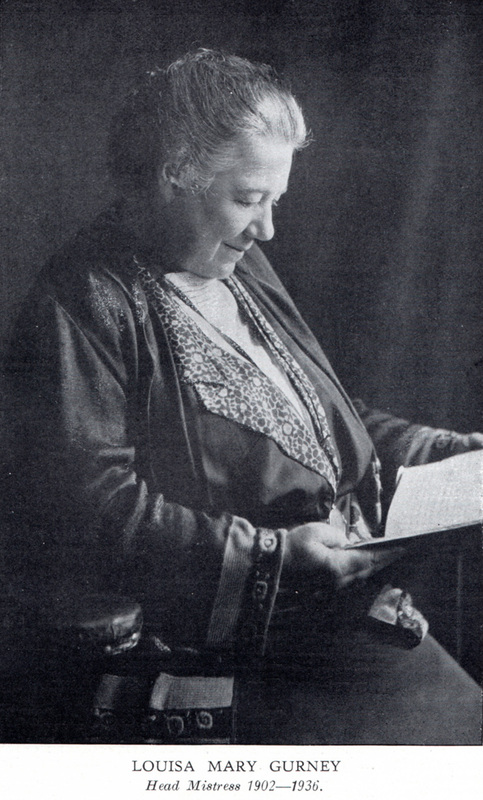 Who knows, perhaps even this lovely picture of Louisa Mary below, taken on her retirement. The last picture of Miss Gurney featured in the 1936 School Magazine. Who knows what that graffiti meant, or who wrote it? I do know that Pyrex (‘almost’ the 2nd graffiti tag!) as a material is very durable though. And I feel it in my bones that the prominent voices which once resounded in the corridors of the old Church High building will not be forgotten. Not if I can help it, anyway. No Compromise CHZ.